Book Cradle Mountain accommodation, Wilmot & Sheffield accommodation, lodges, cabins, bed and breakfasts. Book Cradle Mountain accommodation, Wilmot and Sheffield accommodation at Kentish Visitor Information Centre in Sheffield,Tasmania. Cradle Mountain, Wilmot and Sheffield accommodation is nestled in the agricultural heartland of Tasmania's North West Coast region. Explore "Tasmania's Outdoor Art Gallery" taking you from low-lying Devonport and Latrobe to the tip of the world heritage listed icon, Cradle Mountain. Cradle Mountain, Sheffield, Railton and Wilmot are all part of Tasmania's Outdoor Art Gallery. Experience stunning wilderness at Cradle Mountain, view historical murals at Sheffield's "Town of Murals", topiary at Railton's "Town of Topiary" and Wilmot's "Valley of Views" and letterbox trail. Cradle Mountain National Park is just up the road, a spectacular alpine wilderness waiting for you to explore. Experience natural wilderness, enjoy fun family-friendly attractions, fresh country produce and award-winning local wines. "Tasmania's Outdoor Art Gallery" is a picturesque region with natural wilderness area with wildlife, outdoor mural art, topiary art, a novelty letterbox trail and stunning valley views. 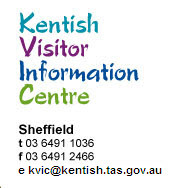 Book your lodges, Cradle Mountain accommodation, Sheffield accommodation and Wilmot accommodation at Kentish Visitor Information Centre now!